In the mid twentieth century the interest in child development grew, more in-depth research took place and a large number of theories arose .Two theorists that had great impact on child development in this era were Jean Piaget and Sigmund Freud. Jean Piaget's research is centered around life stages of cognitive developmental theory, also how children adapt to their environment with the use of schemas, accommodation and assimilation. Like Piaget, Freud also developed a process, which involved stages of development called psychosexual theory. Psychosexual theory centered on the sexual drive and consists of 5 stages of development in children. Freud also divided the mind into three personality parts the id, ego and super ego; these become integrated into the 5 stages of psychosexual development. (Berk, 2009) Jean Piaget was born in 1896 in Neuchatel, Switzerland. Piaget was an intelligent child who took an interest in biology and the natural world at a young age. After Graduating Piaget went on to teach at Grange- Aux-Belles Street School for Boys, Where he worked along side the creator of the Binet Intelligence Test, Alfred Binet. 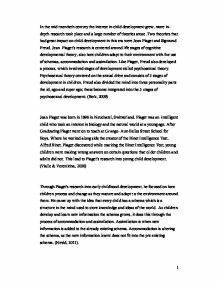 Piaget discovered while marking the Binet Intelligence Test, young children were making wrong answers on certain questions that older children and adults did not. This lead to Piaget's research into young child development. ...read more. He only researched a small number of children, who were all of high social economic status and were educated. Also three of the children researched were his own. This lead to criticism that the research was not valid enough, as he did not research children in other environments and it's hard to generalize his findings to a larger population. Piaget may have under estimated children's abilities. Researches have found that children hold skills at earlier ages than Piaget suggested. Piagets idea of children developing in stages as they mature also has had criticism as research shows that environmental factors and how the child is brought up can play a major role in the development process. (Sutherland, 1992) Sigmund Freud was born 1856 in Moravian town of Freiburg, and was the oldest of 8 children. Freud was a bright child who had planned to study law, instead attending the medical faculty at University of Vienna. He went on to study and find a cure for troubled adults, where the patient talked through their problems of childhood. The goal of this was to realise emotions that had been trapped in the unconscious mind of the adult. Freud believed that sexual life and early childhood development was a factor in troubled adults in adulthood. This research leads to Freud's psychosexual theory. ...read more. Like Piagets theory it is hard to use their ideas in learning and development today in New Zealand, as there is a lot of criticism around their work. Research into child development has expanded over the years and information is more accurate and useful. ( Newman & Newman, 2007). 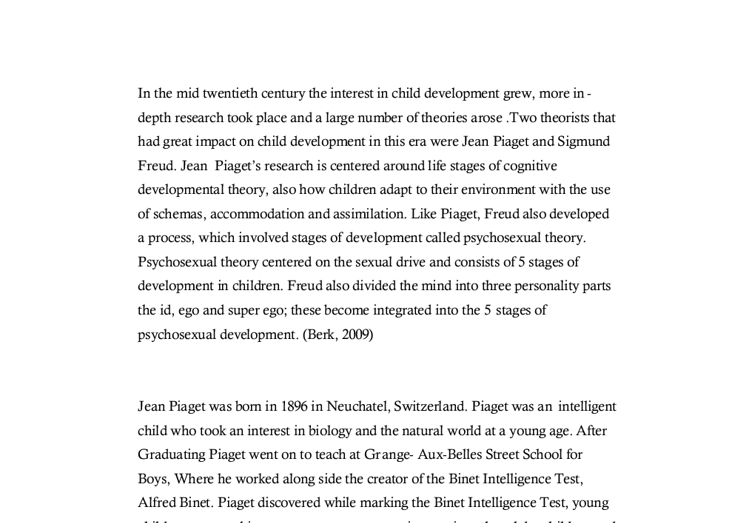 Freud and Piaget influenced future theorists into more in-depth research in child development. Both Freud and Piaget used the idea of children's development being discontinuous and in stages. Piaget focused on sexual drive in young children, Piaget focused on children develop as they adapt to their environment. Both theorists have had criticism surrounded their work which makes it hard to relate their theory's to learning and development in New Zealand today. (Berk, 2009). Reference List Berk, L. (2009). Child development ( 8th ed). United States, Pearsons Publishing. Dennis, C., & Mitterer, O.J. (2006) Introduction to psychology: Gateways to mind and behaviour. United States, Wadsworth Publishing. Louw, A.D. (2002) Human Development. South Africa, Kagiso Publishing. Nevid, J. (2011). Essentials of psychology: Concepts and applications ( 3rd ed.). United States, Wadsworth Publishing. Newman, B., & Newman, P. (2007) Theories of human development. New Jersey, Lawrence Erlbaum Associates, Inc. SparkNotes Editors. (2005). Sparknote on Development. Retrieved March 17, 2011, from http://www.sparknotes.com/psychology/psych101/development/ Sutherland, P. (1992). Cognitive development today: Piaget and his critics. London, Paul Chapman Publishing Ltd. Thurschwell, P. (2000). Routledge critical Thinkers: Sigmund Freud. London, Routledge. Verenikina, I., & Vialle, W. (2000) Handbook on child development. NSW, Social Science Press. 1 ...read more. It is universally known that all children pass through the same stages at similar times, regardless of the amount of reinforcement. So whether a child's language development is instinctive, or if it is learnt by observation and reinforcement, is inconclusive. The five major perspectives in Psychology and their main strengths and weaknesses. Due to advances in this area it is now clear that disorders that was once thought to be purely psychological are now in fact involve genetic factors. This is one area that has contributed to science in many ways and will continue to develop. How can Piaget's and Vygotsky's theories be applied to the classroom? Unlike Piaget Vygotsky believed that the teacher plays a key role in the teaching of a child through interaction and instruction. The teacher needs to be more knowledgeable that the pupil (expert and non-expert roles), the teacher also needs to provide guidance, direction, support and structure. Further support for this argument can be taken from Szasz (1962) who argued that organic mental illness should be classed as physical illness in which mental illness arises. Psychiatrists also use different types of models to aid their diagnosis. The Behavioural model suggests that abnormal behaviours are learned, such as phobias. The practitioner here is structuring the child's learning encounter, to lead the child through the processes. Bruner described this as his scaffolding theory (Bee, 2004). If there is a child who is more demanding in the amount of attention they receive, the practitioner may accompany them throughout the activity. This negative treatment could also extend to the child's every day life at school, through means of taunting by the children of heterosexual couples. Bullying could perhaps reach such a degree that the child begins to begrudge its adoptive parents for causing them to experience such torment. They argued that there was more liquid in the taller container "because it's higher" or in the original container "because it's wider." Piaget also identified that preoperational children's thinking is hugely influenced by egocentrism. This is the tendency to assume that one's way of thinking is the only possible way.